The Rocinante sheds its gas-hauler disguise in the final episode of "The Expanse" Season 1. LOS ANGELES — Actor Cas Anvar of "The Expanse" was about to shoot a scene in which, suspended by wires, he would jump off a set of stairs, spin around in simulated zero gravity, and catch a blob of beer in his mouth that he had spurted from a metal can. But he had a question. "Right before we started rolling, I went, 'Holy crap, how does carbonated beverage perform in zero gravity?'" he said. "Because no one had talked about it, no one had brought it up. So I scrambled and I asked people. And we came up with a thing. That's why I put my hand on top of [the can], because I wasn't sure if it would come gushing out. If you can't see it, we don't have to fix it." 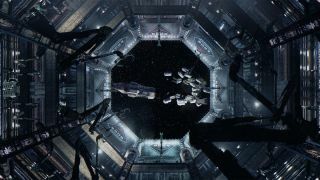 The tension between realism and the needs of dramatic storytelling was a key theme running through a panel discussion on the science of "The Expanse" conducted May 25 during the National Space Society's International Space Development Conference (ISDC) here in Los Angeles. Anvar, who plays Alex Kamal, was joined by fellow cast members Wes Chatham (Amos Burton), Cara Gee (Drummer) and Steven Strait (Jim Holden) along with showrunner Naren Shankar. NASA Jet Propulsion Laboratory engineer Bobak Ferdowsi, known as the Mohawk Guy for his eye-catching haircut, was also on the panel. The audience was treated to several scenes from the television series. One sequence showed a character get his head blown off in zero gravity, after which blood and the ship's oxygen steadily flowed out of a hole in the hull created by the projectile that decapitated him. There was no explosive decompression normally shown in cinematic spaceship hull breaches. Ferdowsi said that would have been unrealistic because of the time required for air to evacuate the room the characters were in. But nonetheless, the scene was extremely graphic. "Why show the hyperviolence of space in its reality? Why not have a shaky camera ― 'Oh no, he's dead?'" asked moderator Kyle Hill, science editor at Nerdist and star of the video series Because Science. "One, because it's awesome," Shankar responded, drawing a huge laugh. "There's no reason to shy away from it. That particular scene was, honestly, right in the book almost beat for beat. It's one of the reasons I wanted to do the show in the first place. There were so many moments there that I had just never seen on the screen." Front row: Steven Strait, Cas Anvar, Cara Gee, Wes Chatham; back row: NASA researcher Bobak Ferdowsi, "Expanse" showrunner Naren Shankar, "Expanse" writer Hallie Lambert and moderator Kyle Hill at a panel on the show May 25 in Los Angeles. The actors talked about the difficulties of performing while wearing heavy spacesuit costumes, at times suspended on wires high above a soundstage floor. These situations create challenges, but they also provide an opportunity to create new ways of acting. It's easy to ruin a scene in simulated zero gravity. "If you're trying to act and you're doing a really dramatic scene, and all of a sudden you lean on something you're not supposed to grab, it's like, 'Oh, that's it,'" Strait said. Gee has a linguistical challenge because her character speaks Belter Creole, a fictional language that represents a mixture of different Earth dialects. "It's definitely a huge challenge," she said. "Because normally when you act in something with an accent you can go home and watch a movie where you can see someone else do that accent. But, we don't have that luxury." While most space shows have instantaneous communications across the vast reaches of space, Ferdowsi felt "The Expanse" gets it right by building in realistic time lags between Earth, Mars and the far-flung human colonies dotting the solar system. "It's incredible to me, I think it makes it feel so alone, makes that space seem so intensively alone — I'm here by myself," he said. Steven Strait, Cara Gee, Wes Chatham and Kyle Hill during a panel on "The Expanse" during the National Space Society's International Space Development Conference in Los Angeles. Hill said the realism built into the show helps viewers connect with the characters. "I think what this show really does is get excited about space and space travel in a way that most shows can only dream of doing," he said. "I think that in showing a more realistic vision of spaceflight, one that is more grounded, I think that people can readily put themselves in the headspace of Belters or Inners or Martians." Gee, who is Native American, also praised the broad representation of ethnicities and races and the gender equality in the show. "It's so rare to be such a diverse group of people on television, and to see women in positions of power," she said. "And it's not about [power], everyone is just really good at their jobs. And I think this show in so many ways is a roadmap to a potential future. And it shows us one possibility. I like to think about how can we do even better than this — how can we do an even better job?" As the actors regaled the audience with tales from the set, they didn't know if they still had jobs. Syfy had canceled the series after the current third season, and negotiations with Amazon Studios for a fourth season had not been finalized. At a gala ISDC dinner several hours later with the cast and crew in attendance, Amazon founder Jeff Bezos put the matter to rest, confirming that the show had been picked up in an announcement greeted with thunderous applause.